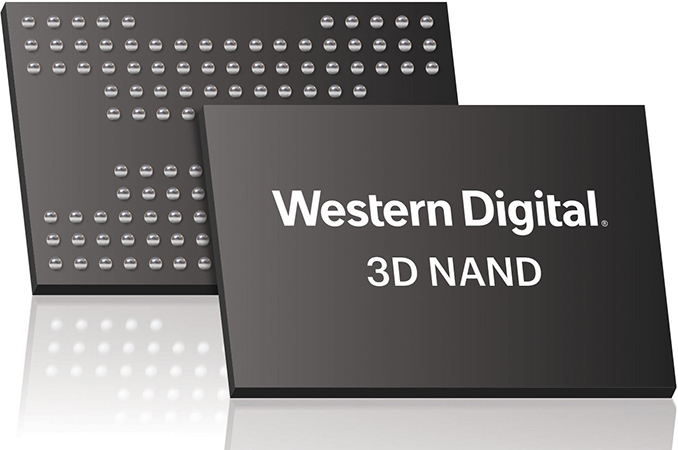 Western Digital this month said that it had started shipments of its fourth-generation BiCS 3D NAND memory to some of its customers. The company did not disclose details, but only said that the 96-layer 3D NAND memory is used for storage devices sold in retail, which usually means that it is used for inexpensive flash drives and/or memory cards. One of the important things about Western Digital’s BiCS4 memory is the manufacturer’s plan to build both TLC and QLC NAND using the technology. 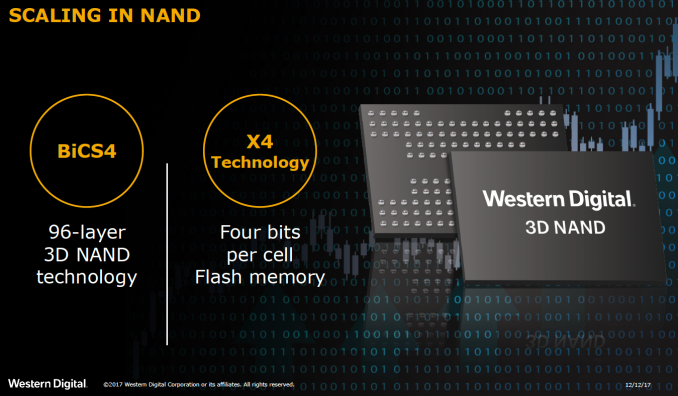 Western Digital started production of its 96-layer BiCS4 NAND memory earlier this year and confirmed the beginning of the ramp up in late April during a conference call. At the J.P. Morgan Global Technology, Media and Communications conference in mid-May the company said that it had started to ship the said chips for revenue to its retail customers. Western Digital does not give any guidelines regarding the pace of the ramp up and the time when shipments of BICS4 exceed shipments of BICS3, but the fact that the ICs are used commercially is important. 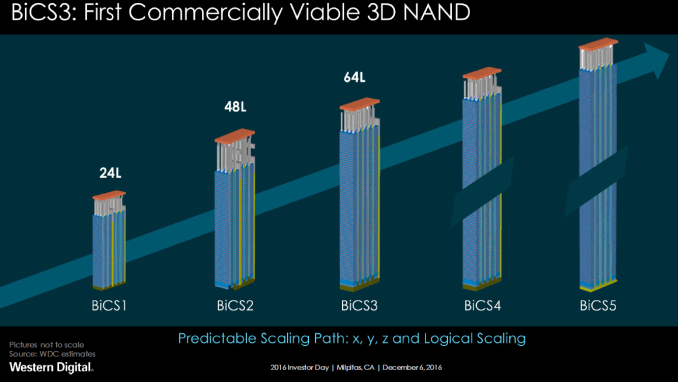 Western Digital’s (and Toshiba’s) BICS4 is a name for a family of 3D NAND flash devices featuring 96 active word lines (or layers). 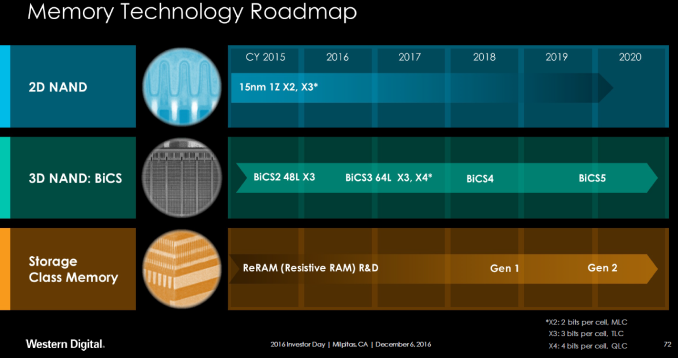 The lineup will include both TLC and QLC chips with capacities ranging from 256 Gb to 1 Tb. Based on Western Digital’s announcement from 2017, its first chips to use 96 word layers are 256 Gb 3D TLC NAND devices. 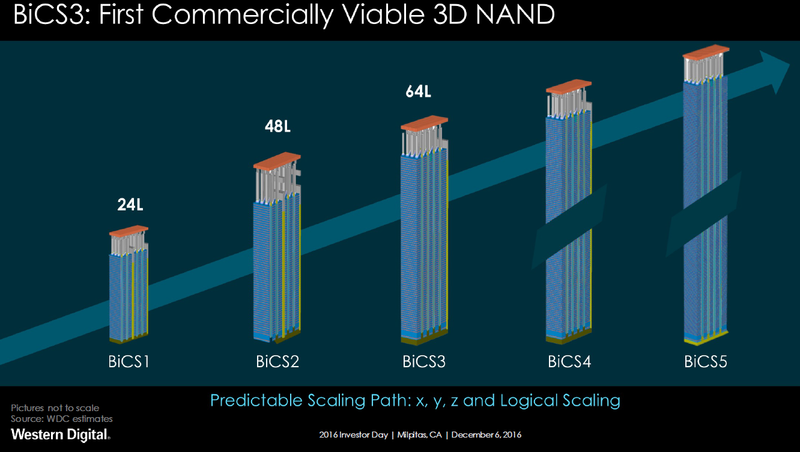 After the manufacturer figures out how to produce 96-layer 3D NAND with sufficient yields, it will move on to higher-capacity 3D TLC and eventually 3D QLC chips with up to 1 Tb (128 GB) capacity. 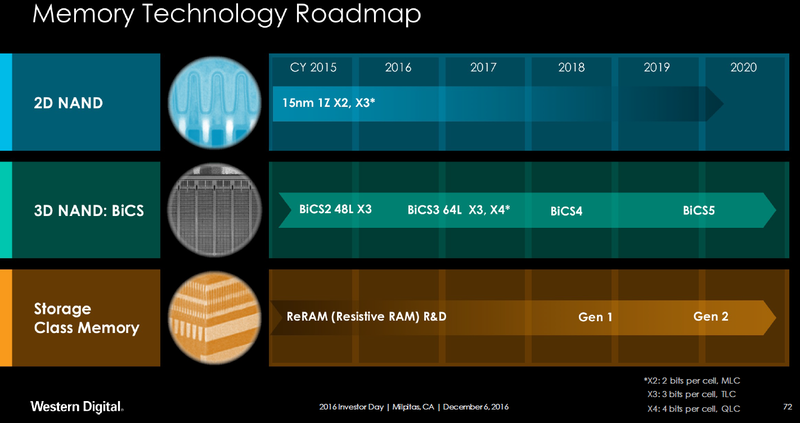 Speaking of QLC, it is necessary to point out that last year Western Digital and Toshiba also announced 768 Gb BICS3 64-layer 3D QLC NAND memory and it is highly likely that such ICs will hit the market earlier than 96-layer QLC NAND. Nonetheless, QLC is a crucial part of Western Digital’s future plans. Toshiba's 768Gb 3D QLC NAND Flash Memory: Matching TLC at 1000 P/E Cycles? I'm guessing no one asked them about the vaporware *ReRAM? Halving the price would begin to let it cut into the SSD market directly; especially if they can get the power low enough to make it a reasonable option for laptops. A $110 for 120GB 3x point module would be big enough to serve as the only drive on a lot of mainstream systems; and is affordable enough to make dual partition enthusiast setups viable; similar to how many of us had a 120/240GB SSD and an HDD a few years back when 512GB of flash was prohibitively expensive.